Sit peacefully with the butterflies at the Fort Meyers Butterfly Estates. There aren’t actually billions of butterflies at The Butterfly Estates, but there certainly are thousands of them. Located in the River District of Fort Meyers, Butterfly Estates is part butterfly conservatory, part botanical gardens, and part historic village. It is a delightful place to visit while vacationing at Southwest Florida Bed and Breakfasts in nearby Bokeelia and Cape Coral. A few hours at The Butterfly Estates does calm and refresh the soul. Guests are invited to sit among gorgeous tropical plants and cascading waterfalls and watch butterflies as they flutter about in search of nectar. 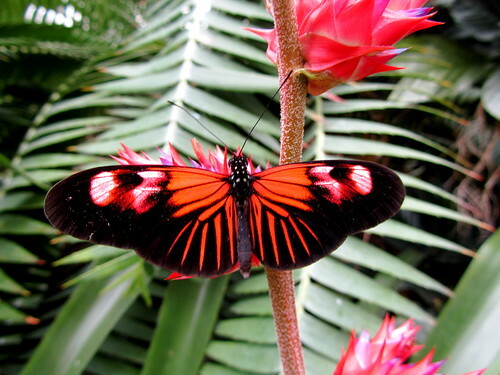 The Glazed Glass Butterfly Conservatory is over 3,500 square feet of fragrant tranquility. If you sit quietly enough, a butterfly may well rest on your shoulders or head. Take it as a good omen – the happiness Hawthorne thought it to be. Fort Meyers is perhaps best known as being home to the Winter Estates of American giants Henry Ford and Thomas Edison. A visit to Fort Meyers is a fun break from days spent lounging on beaches, boating up and down the coast, and jumping waves in the Gulf of Mexico. Fort Meyers has several interesting historic sites, art museums, and nature centers. And Fort Meyers has the Butterfly Estates. Hours and directions are available at The Butterfly Estates. A list of Florida Bed and Breakfasts in Bokeelia and Cape Coral Florida is available at Southwest Florida Bed and Breakfasts. This entry was posted on Monday, October 17th, 2011 at 5:22 pm	and is filed under Southwest Florida. You can follow any responses to this entry through the RSS 2.0 feed. You can leave a response, or trackback from your own site.